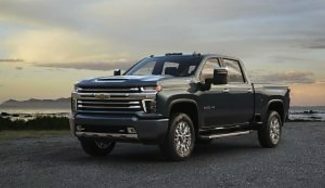 The 2020 Chevrolet HD Silverado has an all new look, it's taller, longer and meaner. Saw it in person and I was impressed. Looking at it head on takes getting used to as with all new designs. Now along with the steps built into the rear bumper, the 2020 HD has an integrated side bedstep, which makes it easier to access the bed for your crossover tool box, towing a fifth-wheel trailer or gooseneck. And for gooseneck trailers, Dodge first went tall years ago and made it hard to use trailers, Ford went too tall for trailers in 2017, of course Silverado went tall, that seems to be what buyers want. Not sure how tall the new HD is yet, but Chevy tells me that the bed rail has been lowered not raised as most truck are doing now a days. We'll see how they trailer next year. Similar to what Ford Super Duty did about 10 years ago they lowered the headlights. That's the way with tall trucks, you don't want your headlights shining over the top of cars, so it makes sense to put the headlights near the bumper and put the blinkers up in the hood. I see the diesel exhaust fluid (DEF) tank filler is in the fuel door instead of under the hood, a big improvement. Sources tell me the DEF tank is now at least level with the frame instead of dragging on the ground. On the drivers side of the front bumper there is a little door for the block heater if you live in the cold. Roof clearance lights are new and look cool. The windshield has more rake, probably more for noise than gas mileage. Tow mirrors are new with the same useful lights, rumors are the one post mirrors will power telescope. They willl be built in Flint, Mich., with a unique bold chiseled look you'd expect in a heavy duty truck. All new sheet metal only sharing the roof panel with the newly designed 2019 Silverado 1500. No word on if any of the body is aluminum. Interior does have similar changes from the 2019 Silverado 1500, which I hope includes moving the trailer brake controller to the right of the steering wheel from the left side. The cab will also be 4 inches longer with 3 inches in front of the rear seat on a crew cab. Meaning the wheelbase will be 4 inches longer and the seats may sit higher. Two engines for 2020 HD, Duramax V-8 diesel have 910 pound-feet of torque with an all new 10-speed Allison Automatic Transmission. A new gas direct injection engine will replace the old 6.0L with a 6-speed auto. We hope that the new trailer technology with trailer app from the 2019 Silverado 1500 will carry to the 2020 HD Silverado. Along with the awesome trailer sticker in the driver's door that tells you that particular trucks, tow capacity, tongue weight, WDH weight and max rear axle weight capacity.